Madhavrao Adkar a contemporary devotee of Shirdi Sai Baba, and also a medium for Shirdi Sai Baba was very good friend to Das Ganu another medium of Shirdi Sai Baba. Madhavrao Adkar was blessed with sweet melodic singing voice with good and devotional looks. He became a medium for popularizing the poetic and devotional song compositions of Das Ganu Maharaj. Both of these good friends shared the intense pull towards devotional music, poetries and singing. Mostly they loved to be immersed in devotion of God with - thoughts, music, singing, reading and music. Noting Madhavrao’s pull towards the divine, Das Ganu took him to Shirdi to his spiritual Guru Sai Baba. The time was about around 1897. Reaching Shirdi and having darshan of Sai Baba Madhavrao experienced the taste of what he was looking for - The peace of mind and devotion he felt in the presence of Sadguru Shri Sai Baba. Madhavrao’s basic pull was towards divine and much less in worldly activities. It is called vairagya, a person much attracted towards the divine and less in worldly matters. Thus it gave him much joy to be in the highly spiritual environment of Shirdi and near his Sadguru Sai Baba. He was not interested in going back to live with his family. His family members and relatives missed his presence and made searches for him, which ended in failures. This ended when a person named Raghopant told them that he was living in Shirdi. Immediately his father along with a companion set off to Shirdi. Like a true devotee Madhavrao obeyed the words of his spiritual master, against his spiritual wishes(Sai Baba knows better). Thus he returned back to his family life along with his father. He knew that the words and guidance of his Guru Sai Baba were the most important, than his own wishes, spiritual of otherwise. The threads of the spiritual growth lies in the hands of Guru, so surrender to Guru’s guidance is best for Spiritual growth and also worldly life. In due course a son was born to him as Sai Baba had said. He was named Ramchandra according to Sai Baba’s advice given much earlier. He also had a daughter who was married to Shri Ropalekar who lived in the sacred land Pandharpur. Just like her mother, she also did not live long. Hence in the thread ceremony of Ramchandra, his father Madhavrao Adkar was the only immediate family member present. Few of Madhavrao’s experiences in Shirdi. Madhavrao’s devotional heart always yearned to be in the sacred land Shirdi. To be in Shirdi and being closer to his Sadguru Sai Baba was what gave him immense happiness. Once, Ramnavami, one of the major festival celebrated in Shirdi was approaching. Madhavrao wanted to be in Shirdi as soon as possible. His feeble health at that time made him anxious. He was worried how he will be able to travel in poor health conditions. As Sai Baba did and do with many devotees, he was able to reach Shirdi:). Two of his friends destined to go to Shirdi, reached him and took him along with them. 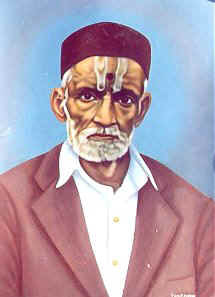 Like many devotees, Madhavrao experienced Sai Baba’s strong presence in Shirdi. He felt Sai Baba’s grace was with him and taking care of him each and every moment. His heart and mind were at rest, knowing his wellbeing and welfare was being taken care of. The compassionate Sai Baba was taking care of him and everything related with him. 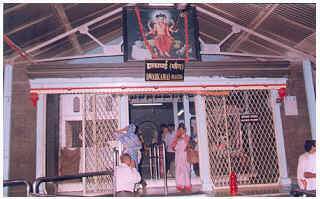 To be in Masjid (Dwarkamai) in the physical presence of Sai Baba was his most loved daily activity while in Shirdi. Once he was disappointed to see a huge crowd waiting to enter Masjid (Dwarkamai). The guards would not allow Madhavrao soon. Just then, Sai Baba sent a message, “Let Madhavrao come in!” Only a devotee with intense desire like Madhavrao can imagine the joy and fulfillment Madhavrao at that moment. The compassionate Sai Baba took under His loving care, the welfare and spiritual progress of the devotional hearted Madhavrao Adkar. Besides the sacred land Shirdi, he also visited other sacred places of pilgrimage in India, such as Kashi, Rameshwar, Balaji(Tirupati Andhra Pradesh), Gangapur, Narasobachi Wadi, Mahur, Tuljapur, Pandharpur and many other. During these visits he was also fortunate to have the darshan and company and blessings of Spiritual Masters, sages and holy men like, Gajanan Maharaj, Akkalkot Swami, Balbheem Maharaj, Sakhaya Swami Dehukar, Vaskar, Vyankat Swami, Vinayakbua, Dada Maharaj. His love for singing devotional songs, enhanced by love for in-study of spiritual and religious subjects. Madhavrao also enjoyed studying various spiritual, religious, mythological and historic topics. So this along with his devotional heart and sweet singing voice made him a popular singer among people. People loved to attend his singing and Kirtans (singing of bhajans and rendering spiritual talks). Madhavrao was also gifted with the composing of poems. He always bowed his head before his dear friend Das Ganu Maharaj a composer. He made it a point to attend Das Ganu’s Kirtans whenever he could. He memorized most of Das Ganu’s compositions and poems and Kirtans. Another good practice of Das Ganu he followed was that of recite Vishnu-Sahashra-Naam 12 times daily. We can also find Sai Baba explaining importance of Vishnu-Sahasranama to Shama in chapter 27 of Shri Sai Satcharitra. 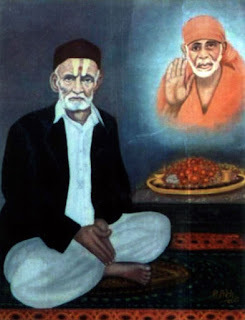 He also accompanied his dear and respected friend Das Ganu in Ramnavami festival in Shirdi every year, until 1952 A.D.
More on Contemporary devotees of Shirdi Sai Baba.